Gift cards are a great way to bring customers into your store, especially after the holidays. And they may also be a source of unexpected income, because according the advisory company CEB TowerGroup, quoted on MarketWatch, about $1 billion of the $130 billion gift cards purchased each year are not redeemed. Many people who do use their gift card end up spending more than the value of the card. And another plus: gift cards are easy to sell online, so they are perfect for someone from another part of the country wanting to invite a friend or relative to come into your shop for something special. 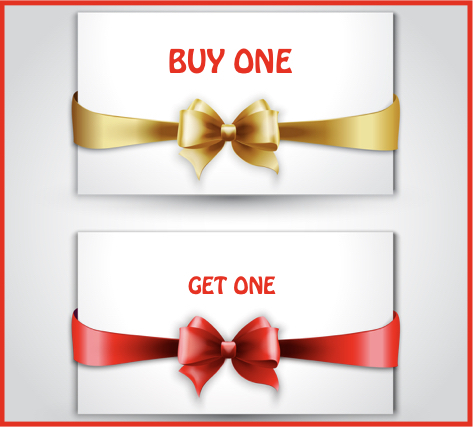 Here is a simple last-minute holiday promotion to encourage consumers to buy your gift cards: offer a buy one, get one (BOGO) enticement such as one free $10 card with every $100 card purchased. There are several ways to do this, for example suggesting that customers use the $10 card to treat themselves to something after the holidays. Restaurants have been using this promotion for several years now with great success, according to USA Today. They often have time limitations and exclusions on the bonus card, which probably isn’t a good idea for retailers since it doesn’t garner goodwill if the card expires. Assuming that a certain percentage of cards are not redeemed, offering a free bonus card valued at about 10% of the original purchase may be a no-cost way to promote gift card purchases. We plan to try it this year the week before Christmas to see if we can help last minute shoppers get a good deal – and a good gift. PS This is the 500th blog entry for Specialty Shop Retailing – thank you for being a faithful reader!